Gardens Of Arts : In this terrace garden right next to the rampart of Périgords green capital, contemporary art is encased in a green shrine overlooking the Bandiat river valley. 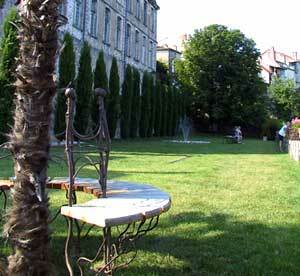 Furniture and fountains are unique artworks, designed and crafted on site by exceptional artists, designers and craftsmen. Crowned by a 18th century chateau, ”Les Jardins des Arts” are an next to unique example of a landscape garden between countryside and town. Visits are free all year long. The ramparts are illuminated at night. "Les Jardins des Arts", avenue du Général Leclerc, by way of the ancient stables of the castle and the tourist office.